Before The Apple Store, There Was A Chain Of Unofficial Apple Retail Locations Known As? Long before there were Apple stores with Genius bars, there was the “Newton Source” with an approach to selling Apple products that, despite being unofficial and totally independent from the Apple corporation, looked a whole lot like a modern Apple store. In 1994, Stephen Elms opened up the first Newton Source store across from the Plaza hotel on Fifth Avenue in New York City. 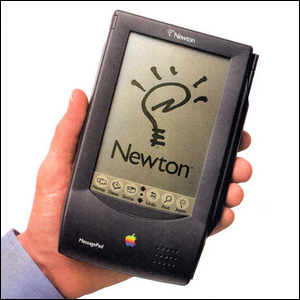 The store was entirely dedicated to promoting and selling the Newton personal digital assistant and, most curiously, Elms had no connection to Apple other than he was a devotee of the Newton platform and didn’t like the way the Newton and other products were sold in computer stores. His store was airy, tastefully designed, had a relaxed atmosphere, and the products were displayed at stations where assistants could teach you about them and walk you through their use. Like the Newton itself, the Newton Source locations in New York, Los Angeles, and other major U.S. cities faded away towards the end of the 1990s.